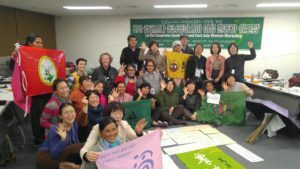 (Seoul, South Korea – 24 Jan.) La Via Campesina South East and East Asia held its 2nd women workshop since the first in 2017 in Sarawak, Malaysia. The Korean Women Peasants Association(KWPA) hosted this meeting on 24-26 January in Seoul Women Plaza. The workshop started on 24th January in Seoul, South Korea with nine delegates from Japan, Taiwan, Philippines, Indonesia, Malaysia, Cambodia, Australia and Timor Leste. 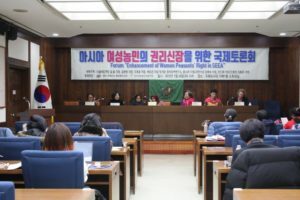 The first day of this event included the international Forum “Enhancement of Women Peasants’ Right in South East and East Asia”, which was taken place in the Korean National Assembly. “Through in-depth discussions, alternatives and actions on the reality of women farmers in each country and our actions, we will change our lives on our own and initiate a stronger alliance to improve the position and rights of our female peasants, from this very moment.” said Jeongyeol Kim, ICC of South East and East Asia. 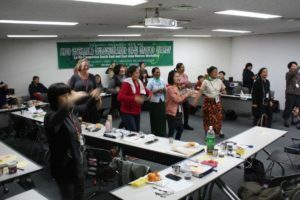 On the second day of workshop, participants were given two presentations: “Empowerment and leadership for women peasants in Asian countries” and “Peasant women, our movement and our lives”. In the afternoon, the women leaders also set up their own regional action plan for the year of 2018. Throughout the day, the participants had time to think about the gender issues and patriarchy in their own society and culture and shared cases each other. Sengju where people have been struggling against the installation of THAAD, US missile defense radar system for the last 2 years; and Sangju where participants could observe one of the best example of CSA (community supported agriculture). During the interaction with Seongju people, most of whom were old women peasants, and while listening to their stories of struggle against the militarization that actually put the safety in the whole Asian region at the risk of war, the participants found the experiences deeply moving and promised that they would let their own people know about this struggle when they return home. 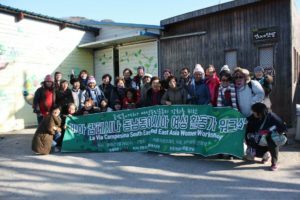 The women leaders engaged themselves to publish a statement of solidarity for the Seongju people against THAAD.